Social media marketing is more important than ever to make sure your personal brand comes through. Check out some of these tips from Andrea Saye ’08, GAA manager of marketing and advertising, to help your brand standout like the Old Well. There are more than 7.4 billion people on this planet we call home. Can you believe 2.8 billion of them are on social media? Whether we like it or not, our mobile phones have become the innocent man’s ankle bracelet and what we are all doing on our phones – social media – is a way of life that is not going away any time soon. Now more than ever, you and your brand need to be where the people are, on social media. And not just be there, but do one Heel of a good job while you’re there too. 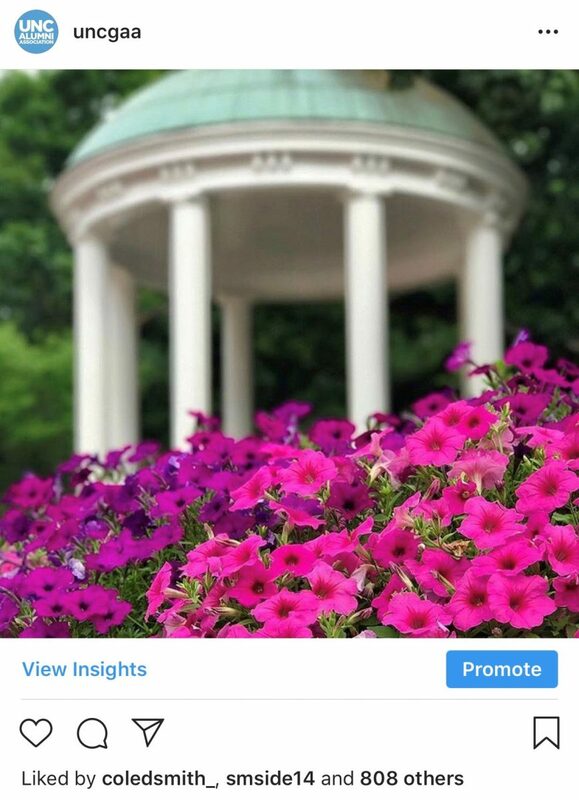 As #UNCAlumni, we all love the Old Well. Why? Because it never. gets. old. Just like the Old Well stands on its columns, your brand has columns, well, pillars, it should stand on too. Establishing the main pillars of your social media brand lay the foundation and determine the direction your social media presence will take. Once you have a cohesive vision for your brand, the rest comes down to: Good photography, photo editing, aesthetic continuity. These are all key to getting followers and making sure they stay a while. We do not want people up and leaving before it’s time to sing the alma mater at the end of the game, if you know what I mean. Be human. Find your social media sweet spot. Know that while there are a bazillion social media avenues you could take, it’s okay to focus on one of them and do it really Well (see what I did there?). For more information on Leveraging Social Media to Build Your Brand, GAA members can view a recorded webinar.